In 1912, with the introduction of the Cadillac Touring Edition, Cadillac drove the automotive industry forward with the invention of the electric starter. Prior to this innovation drivers had to use hand cranks, which were the leading cause of automotive injuries. In 1943, Cadillac ushered in a new era of style and function with the hiring of Helene Rother. As the first female automotive designer, she helped reimagine and reinvent automotive interiors. In the 1950’s, after the attack on Pearl Harbor, President Franklin D. Roosevelt made use of a custom built, bulletproof Cadillac. Since then, many U.S. Presidents and world leaders have chosen Cadillac as their presidential vehicle. In 2017, Cadillac is continuing the tradition of forward thinking with the introduction of breakthrough technologies like available Super Cruise™ 2, the advanced driver assist technology, as well as available vehicle-to-vehicle (V2V)3 communication. The evolution of driving never stops. And neither will Cadillac. As you can see, Cadillac has a reputation for completing dares that people thought were impossible. To this day, the daring is still happening and Finch Chevrolet couldn’t help but to jump in on the action. The 2018 National Cadillac Dealer Ride consisted of 200 riders from all the Cadillac stores in Canada and they were dared to do what some people might think was impossible, or very difficult to say the least. 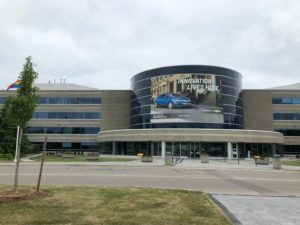 Jordin Finch – who is the Managing Partner of Finch Chevrolet, and Kevin DiBrita – who is a Sales Representative at Finch Chevrolet, pedalled their way from Oshawa Ontario (Headquarters for General Motors Canada) to around the CN Tower (Toronto Ontario) and back. Take a second and just imagine the distance between the two cities. According to Google Maps, that’s a 49 minute car ride from Oshawa to Toronto and approximately 3 hours and 41 minutes to ride a bike the same distance. Now that we’ve factored in the length of the bike ride, let’s also factor in the estimated scheduled. Riders departured at 8:00AM and were estimated to conclude the ride at GM Canada by 4:00PM. Although this wasn’t a race but instead a test of will power, this meant that in order to fulfill the desired schedule, riders would have to go continuously making minimal stops. 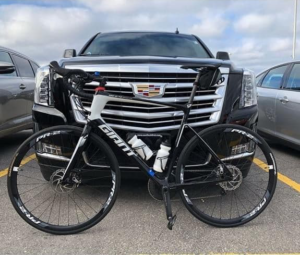 So let’s take a moment and congratulate Jordin and Kevin for accomplishing The National Cadillac Dealer Ride – good job guys, be sure to ice those sore legs!